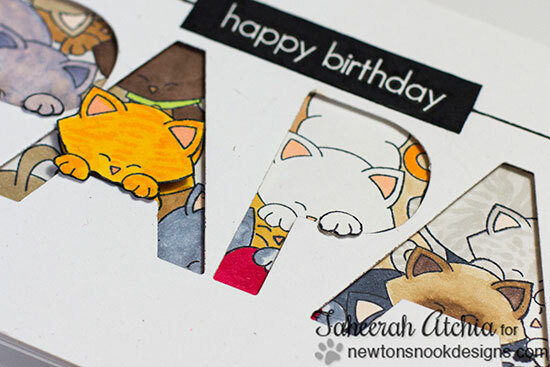 Newton's Nook Designs: Cat Frenzy with Taheerah Atchia! Check out all those crazy kitties on this card by Taheerah Atchia! Can you believe how many cute kitties she stamped and colored for this fun card? 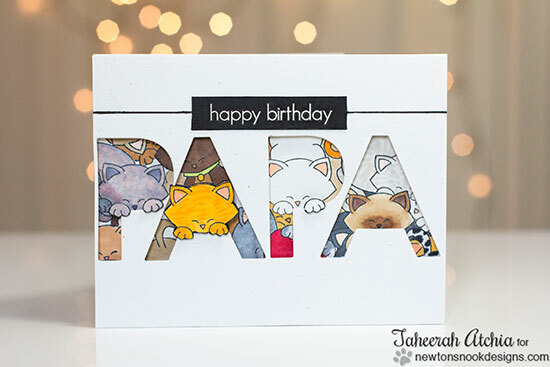 I love how the card is simple white with just the cut out letters that balance all the fun kitty chaos underneath them! I spy Newton's Antics, Newton's Holiday Mischief and Newton's Birthday Bash kitties in there! She must have spent a ton of time coloring all those kitties! Thanks, Taheerah, for sharing this super fun card today! I seriously want this card, even though I'm not a Papa! All those delightful kitties! This is a perfect card for a crazy cat lady...mean cat man! LOL! What a fun and unique card, absolutely love it!! Charming and sweet. Taheerah's ability to corral all those kitties behind PAPA is a stroke of genius. Such a lovely card - and so much detail! What a great card! Brilliant design! Well, if this isn't a spectacular show-stopping, jaw-dropping, awe-inspiring card, then I don't know what is! AWESOME!! Taheerah certainly works magic with NN images!